There’s nothing quite like historical photos of glaciers to show what a dynamic planet we live on. Alaska’s Muir Glacier, like many Alaskan glaciers, has retreated and thinned dramatically since the 19th century. This particular pair of images shows the glacier’s continued retreat and thinning in the second half of the 20th century. From 1941 to 2004, the front of the glacier moved back about seven miles while its thickness decreased by more than 2,625 feet, according to the National Snow and Ice Data Center. Snow and Ice Data Center/World Data Center for Glaciology. Use the study, at http://www.jpl.nasa.gov/news/news.php?release=2012-036, when teaching the NES lessons, Earth Climate Course or Satellite Meteorology, both found on the NASA Explorer Schools Virtual Campus. 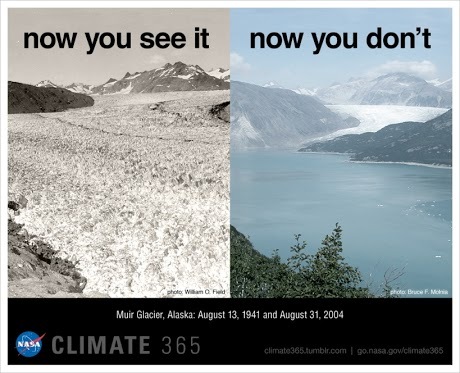 For more historical images of glaciers, visit http://nsidc.org/data/glacier_photo/ or http://climate.nasa.gov/interactives/global_ice_viewer.